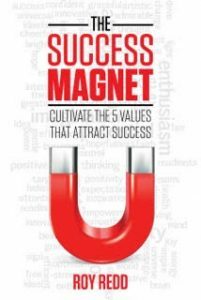 THE SUCCESS MAGNET is a book that teaches tangible systems and ideas that will transform you into a Success Magnet. A Success Magnet is a person who becomes attractive for success so that they no longer have to chase success and waste energy. This book takes really big ideas and articulates them in a way anybody can understand them. If you read this book you will be inspired and you will be taught to master success on all levels. In this book, Roy argues that the social paradigms on what success is are just not true. Roy articulates three facts about success that are looked over. Roy defines success as the achievement of a future ideal. With this definition, Roy is trying to say that success can not be what society says it is, but rather a self-expressive personal journey. Furthermore, Roy explains that success is not a destination. The purpose of human beings is to grow as much as possible during their whole life, and if people continuously grow, how can success be a destination? You see, success is a personal journey of finding one’s self and actualizing one’s own beingness over a course of an entire lifetime. Success is very paradoxical in this way: You are successful when you reach the desired ideal you have, but at the same time you aren’t successful because now you have newer more bold ideal’s to reach. You already are successful, but at the same time, you can’t be successful if you are. This book is amazing and you will love it. At one point in my life I was broke, depressed, and embarrassed, then I had a course of events take place in my life that lead me from being broke to making six figures. I simply learned to take responsibility for my life and from their the universe got on my side to help me succeed. "What freed me up from judging others is allowing them to judge me, don't judge me we say, but to not judge is to also not judge others for judging you."